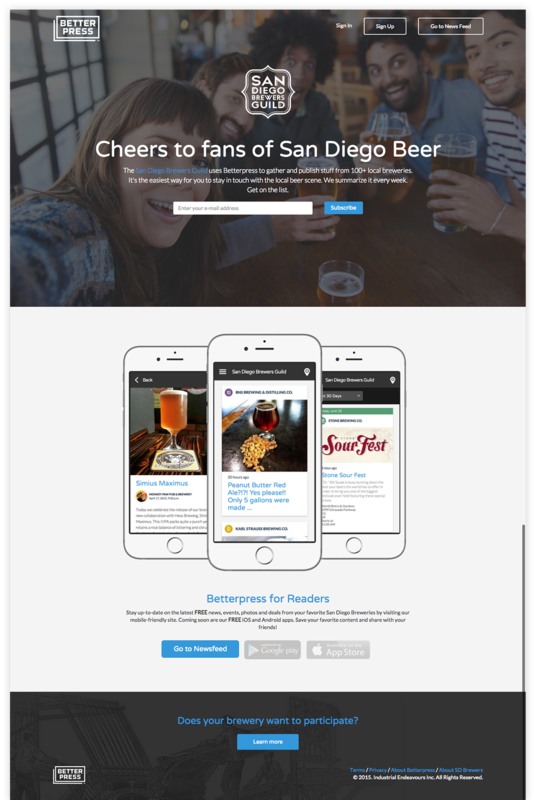 The San Diego Brewers Guild uses Betterpress to gather and publish stuff from 100+ local breweries. 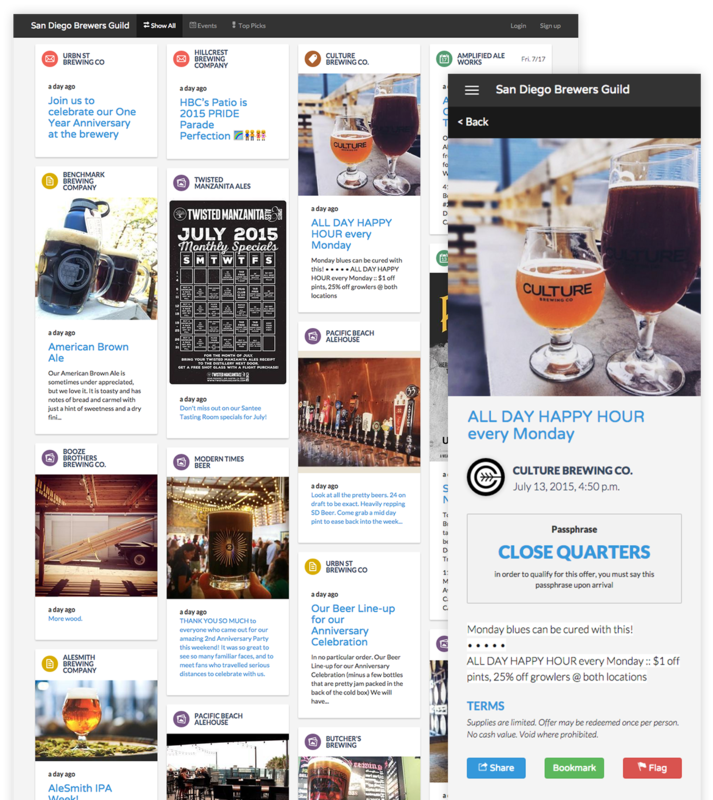 It's the easiest way for you to stay in touch with the local beer scene. Betterpress was a new concept developed by Doug Gates of San Diego. He hired me to help architect the design of the publishing platform, conduct usability testing, and build the front-end of the application. 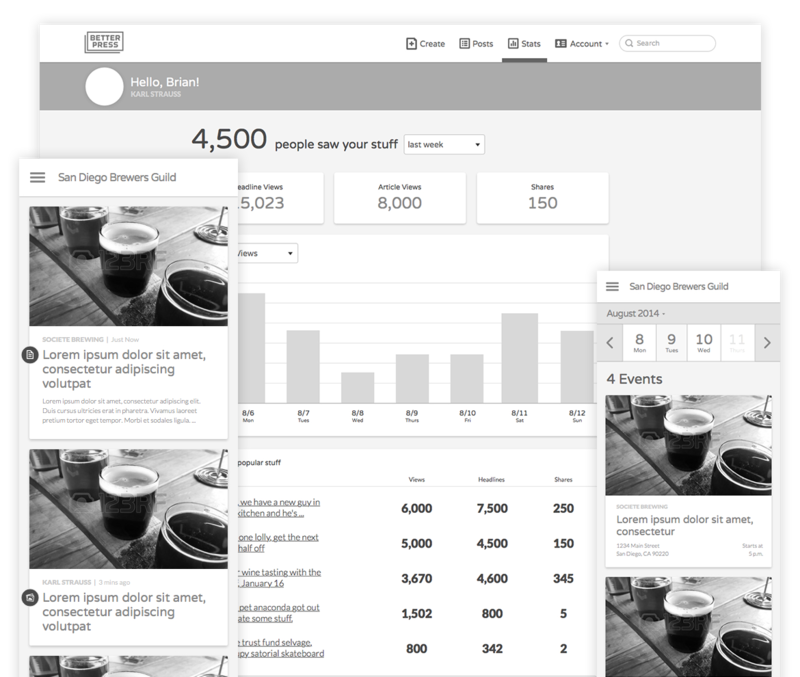 The platform allows craft breweries to produce content and share with its fans. Betterpress was built as a responsive, multi-platform application to fit any device or browser size. The application was built using the Bootstrap Framework. In addition, I customized the design for a multi-platform application available on iOS and Android. I was in charge of user experience strategy, research and design, in addition to the visual design and front-end development of the platform. I worked with another developer to integrate it into a Python/Django backend. I designed wireframes based on the user flows, and reviewed each of them with potential users. After three rounds of revisions and testing, I finalized the layout of the various features. I completed several rounds of mockups while working with Doug on Betterpress. Based on user feedback, I made adjustments to improve the experience. I worked with Doug in crafting two different home page designs. Upon completion, we tested the two versions and launched the one that converted best. I worked closely with Joey to create some web and mobile applications. He is a glorious designer. He produced some beautiful mockups that reflected the product requirements, visited some customers and got feedback, and then designed and built a working front-end that perfectly reflects the modified mockups. The work that he has done is top-notch, and we’re betting on it in a big way. He’s a good guy with good communication skills, and he knows his way through and around the design process. I will happily work with Joey again.